Metropolis II at LACMA: Will a Sculpture Made of 1,100 Hot Wheels Predict L.A.'s Future? Could this be L.A.'s transportation future? Where once art originated from the front seat of a freewheeling Los Angeles vehicle -- Ed Ruscha's Every Building on the Sunset Strip photography series, Dennis Hopper's Double Standard photograph of a gas station -- our kill-me-now traffic has forced local artists to step outside the car and start examining our transit problems instead. "The future of automobile transportation is that there won't be drivers anymore," proclaimed Chris Burden to audible gasps and some giggles at the opening of Metropolis II, his giant kinetic sculpture now installed at LACMA. The 1,100 customized Hot Wheels cars whirring through a city of building-block skyscrapers is a scale model of Burden's vision for L.A.'s future: Cars that are swiftly autopiloted along pre-determined routes, moving ten times faster than they do today. "It's a hopeful future," he offered. "Cars will have an average speed of 230 miles per hour as soon as Google gets all their cars up and running." Alluding to the company's recently patented driverless car program may have been surprising to the art critics in the room, but the transit nerds like me nodded in agreement. According to transportation theorists, autonomous automobiles may be the only hope for curing L.A.'s humiliating gridlock. Giddy chatter of bike lanes peppers our conversations, but Metropolis II might be the more realistic visualization of L.A.'s transit future. Will the average viewer buy into Burden's wonky mandate? Maybe not, but it doesn't matter. Like Urban Light, Burden's formation of 202 vintage street lamps at LACMA's front door, Metropolis II works on every level. The combination of colorful cars and playtime materials lend it an aura of toy box fantasy that will delight anyone who walks into the room. The cars are dramatically lifted eight feet in the air by a magnetized conveyor belt then dispatched through the city on a roller coaster network of plastic roadways. The buildings are constructed with Legos and Lincoln Logs, Erector Sets (a nod to his 2008 Rockefeller Center installation), and stacking slotted cards that echo the House of Cards created by the Eames Office. A dozen out-of-the-box electric trains chug casually through the sculpture. So much for high-speed rail. Although its focus is on the driverless car, one of Metropolis II's most compelling features is human: one of Burden's assistants must stand at the center of the city and monitor the tracks for potential Sigalerts. "It's just like real life on the 405," said operator Rich Sandomeno, pointing to safety measures like tiny brushes that slow the cars down around dangerous curves. Due to the physical strain on both the sculpture and its keepers -- they wear earplugs and must watch closely for pileups -- Metropolis II can only run for an hour-and-a-half at a time, a few days a week, hence the seemingly haphazard, weekend-only operating schedule. 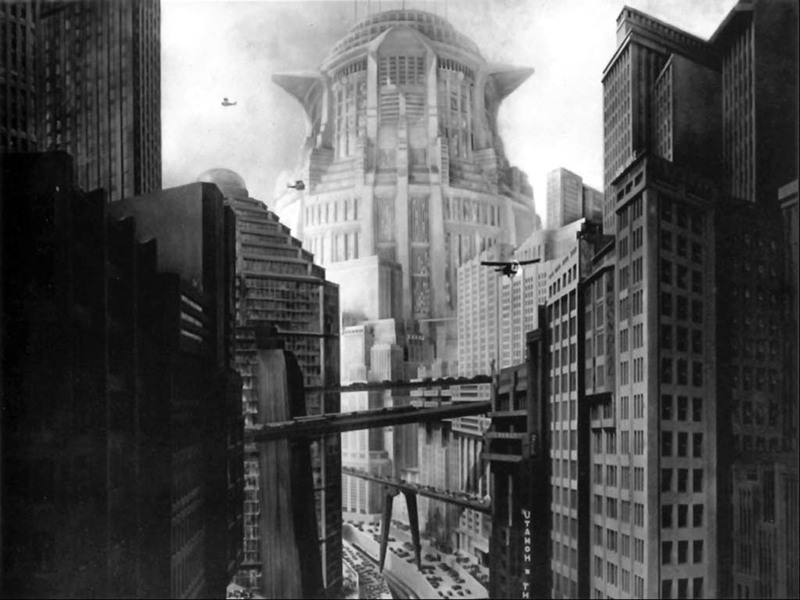 Like Burden promised, Metropolis II is not a dystopian urban vision, like the 1927 Fritz Lang film that inspired its name. But the rattle of the tracks -- the cars emit a deafening yet melodic roar, like the buzzing of hundreds of mechanized bees -- combined with the tangle of the steel beams creates a jarring sensation, so it's best to start your visit on the catwalk above to get your bearings. I'm hoping LACMA will eventually install risers that allow viewers to sit and watch from a needed distance at an elevated position on the ground floor, like spectators at the California Speedway. And in that sense, Metropolis II is less like sculpture, and more like watching the Pixar version of Blade Runner. It's pulsing, dizzying, anxiety-generating and highly entertaining. I had no trouble lingering for the full 90 minutes, wandering the vignettes of L.A.'s future: the reflection of a busy onramp in a golden mylar tower; a quiet woodblock village atop a church-studded hillside. I found myself deciding which side of the city would be my neighborhood, which floor of that pink Jenga-esque tower I would rent. I wanted to live there now. I walked back outside -- the sound, the colors, the speed still agitating my brain -- and stared at Wilshire's frustratingly horizontal streets, its painfully sleepy traffic. I waited for the bus, watching as human-operated cars crawled clumsily through the intersection. Metropolis II will operate this Saturday, Sunday and Monday, then every Friday, Saturday and Sunday. Check LACMA's site for operating times. Alissa Walker blogs at Gelatobaby.com. Follow her on Twitter at @gelatobaby and for more arts news follow @LAWeeklyArts.